More homeowners are opting to lose the bathroom tub and instead design a spacious shower with luxurious fixtures to give it a spa like feel. As a result, the shower is becoming more of the centerpiece of the bathroom. Frameless glass shower doors and enclosures have increased in popularity as homeowners desire a cleaner, more minimalist and less cluttered look. If you currently have a shower/tub combo and have a shower curtain or older glass shower doors, you may be in the position of needing to remodel because of leaks, noise, or just because the glass doors are dirty or the curtain is just not stylish anymore. When remodeling your bathroom, one of the biggest mistakes you can make is putting off the shower door and enclosure decisions until the end of the project. 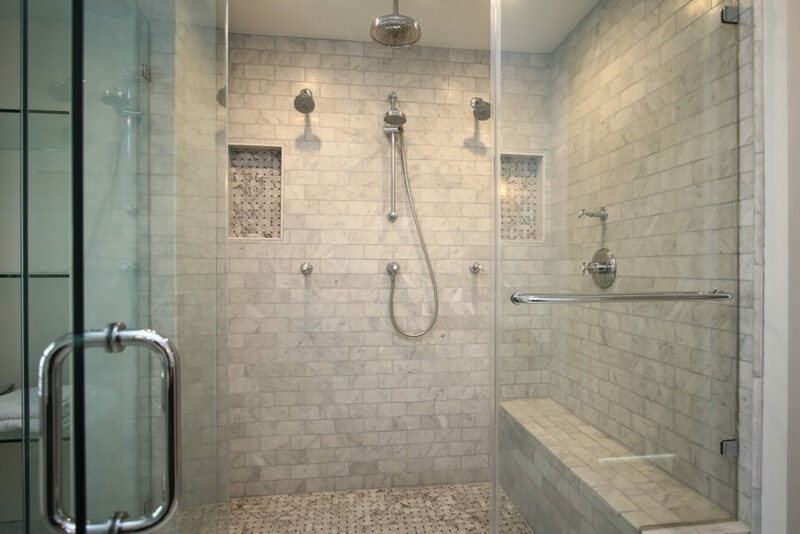 Many people tend to focus on the tile and fixtures first, but since the shower is the catalyst for the bathroom, we recommend that you make shower selections first when planning your renovation. Another decision when remodeling your shower is where to position of the shower head. It can be either a side or overhead mount. Those placements will help to prevent spraying of water directly on the door. If your shower wall has a depth of at least four feet, the showerhead can comfortably be mounted on the back wall. When choosing frameless glass shower doors, there are several hardware, hinges and handle finishes and style options to choose from. There are also many glass options to consider in addition to clear glass. Choices include frosted, etched, rain and textured patterns. One of the major advantages of installing frameless glass shower enclosures is the ability to customize to meet your needs and maximize space. When choosing a professional to design and install your shower doors or enclosure, it is advisable to work with a professional glass company to make sure that you are getting quality products and experienced technicians. The bathroom is one of the most used rooms in the home. Remodeling a bathroom has been shown to provide an excellent return on investment for resale and personal enjoyment. Adding or upgrading frameless shower doors is presently one of the best bathroom upgrades you can make. This article was written by Stacy Argo and was published in the Houston Chronicle on July 8th, 2018.